Since the legendary Go match between AlphaGo and Lee Sedol in 2016, when Google’s DeepMind product beat the 18-time world champion — marking the first time a computer beats a 9-dan professional, the world has been all the more captivated by the power of artificial intelligence. At once fascinating and formidable, machine learning has the potential to radically change human lives for the better, whether it be through aspects such as natural language processing, bioinformatics, or credit card fraud detection. For its many obvious benefits, however, AI technology has yet to see mass adoption by businesses across the board. In fact, only 21 percent of enterprises surveyed in a McKinsey report say that they have incorporated AI in parts of their business, mostly in areas such as service operations and product development. Among the top ranked reasons for this include a lack of AI talent and a lack of technological infrastructure to support AI implementation. So far, only the big players in the tech space have been able to develop solid go-to-market AI solutions, with the gamut not extending much further beyond Amazon’s Alexa, Google’s TensorFlow, and Apple’s Siri. Realizing that small companies are placed at an acute disadvantage when it comes to finding quality training data to build AI algorithms, Chris Dawe and his founding team members Jesse Eisses and Lauren Verspeek decided to create a decentralized model for data annotations with the aim of helping companies kickstart their AI initiatives. 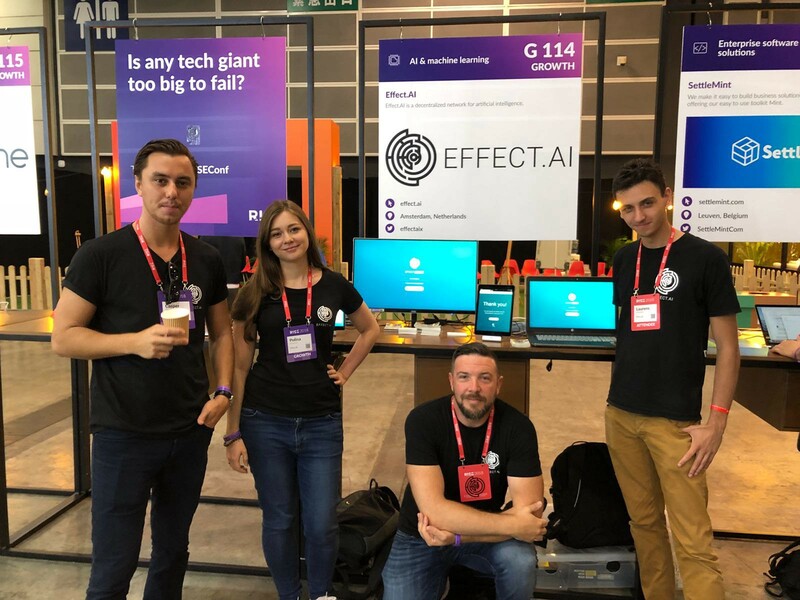 With that, Effect.AI was born as “an open, democratic & decentralized network for artificial intelligence.” Specifically, the team recognized that the foundation of this network is a global microtasking workforce, one that will carry out machine learning tasks such as data annotation, sentiment analysis and survey completion — supported by a marketplace that facilitates the exchange of AI solutions and services, much like Amazon’s Mechanical Turk (MTurk). Offering a blockchain alternative to MTurk, Effect.AI helps developers build and monetize AI algorithms, all the while providing a distributed ‘global supercomputer’ that can power the GPU-heavy deep learning frameworks built on top of the TEN protocol, which is a tech stack of smart contracts and algorithms that allows anyone to build their own AI services on the network. It is indeed timely that Dawe, Eissens and Verspeek have identified this natural synergy between blockchain and artificial intelligence, given that both forms of emerging technology possess huge potential to grow global economic activity in the next three decades. AI in particular is forecasted to deliver an additional USD 13 trillion to the world market by 2030, while blockchain-related services have been suggested to comprise 10 percent of global GDP by 2027. Blockchain is also uniquely positioned to address some of the biggest pain points in AI adoption at present: by allowing for the decentralized ownership of and access to AI, blockchain networks can open up new pools of large annotated datasets, as well as help power the complex technical infrastructure needed for AI implementation with distributed computation, both of which are aspects that have thus far given the likes of GAFA a monopolistic edge over AI development. For example, because there is no middleman involved in the decentralized microtasking platform (called ‘Effect Force’), its registered workers can receive instant payment from service requesters, who will in turn receive AI algorithms and solutions for a way lower price than if they were to engage Amazon, Google or Apple for AI services. And over the span of just 18 months, more than 2 million data annotations have already been performed on the Effect Network, some of which are for companies working with NLP (e.g. chatbots, translations, sentiment analysis) and computer vision (e.g. automotive, image tagging). Having partnered with the United Nations and the Government of Singapore on several pilot projects, the Effect.AI team also has big, bold plans to make a global impact. In collaboration with the UN, they are now setting up a social impact hub in Georgia, which aims to “provide jobs to those [in developing countries] who need them (by enlisting local workers for the microtasking ‘Effect Force’ platform), allowing them to educate themselves and work on something that has meaning and impact”. 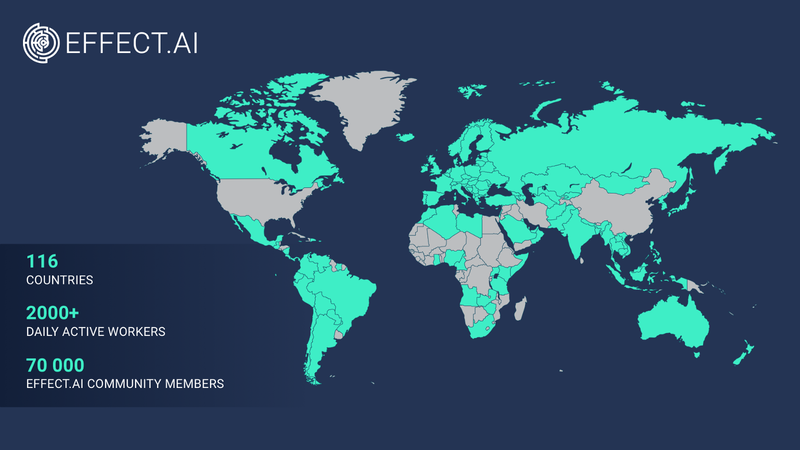 According to Effect.AI’s January newsletter, one of the goals of this collaboration is to encourage the UN to “use Effect Force to enrich and structure data to solve pressing issues in Georgia, like disaster/flooding prediction and relief, sustainable living, and other matters the UN are closely monitoring in the region”. In a similar vein, ‘Effect Force’ is providing Singapore’s Info-communications Media Development Authority (IMDA) with the required labor for a geo-mapping project, which would entail “Effect Force workers identifying and categorizing geographic details from satellite images”. As such, these initiatives show that a decentralized, blockchain-based AI system has the power to accelerate developments in humanitarian aid and government. Having participated in Block.one’s 2018 EOS London Hackathon as mentors, the founding team found the support to be overwhelming. “We felt the powerful strength and positivity of the EOS community [at the hackathon], and the experience solidified our decision to build on EOSIO,” added Dawe. “When we officially announced the migration of our project to EOSIO, the community response was unreal. We must have received over 200 messages from EOS developers and community members welcoming us and offering their support.” And as well they should, since the Effect.AI team is clearly working towards a worthy and innovative cause of making artificial intelligence more accessible to the world through blockchain infrastructure, whether it be for technologists, businesses or governments. Block.one does not endorse any third party or its products or services, even if they are mentioned herein. Block.one is not responsible for any linked content or content provided by third parties, whether used directly or incorporated into this document.